Happy New Year 2017! I know it's been extremely quiet on my blog for the past few weeks but at the end of each year I think it's time to prioritise-and for me that meant work, family and friends all came first. However now I'm refreshed and ready to go. And by refreshed I mean literally-mentally and visually. For my first post of 2017 I wanted to talk about some recent aesthetic treatments I had whilst I was in London-why I did it, where I did it, what I had done and what it was like. And 2 weeks later how I feel about the results. I had a small amount of botox between my eyebrows, fillers under my eyes and three skin tags removed from my eye area. I had all the treatments done with Dr Maryam Zamani at the Cadogan Clinic in Sloane Street. Dr Zamani is an incredible Oculoplastic Surgeon and who specialises not only surgery for all types of cosmetic eye concerns but also in facial aesthetics-quite simply she helps men and women to look their best by making small meticulous tweaks. There's a variety of reasons if I'm honest. The skin tag on my lash line was actually my main concern over everything bizarrely. It was a skin tag that was 'live' and growing and in such an awkward position. I was so utterly self conscious of it that I would never be seen without liner and mascara. It genuinely made me feel ugly. I had researched and researched getting it removed but really struggled to find information online about having one in that position removed. I was also so fearful because it was so close to my eye. I understand that some people might not think this is a bit deal but for me it was. And this is the whole point of aesthetics. They can be tiny changes that change peoples confidence levels immeasurably. As you can see from the photo below, I also had a small skin tag on my right eyelid and I also had another small one under my left eye-neither of these bothered me as much as the one on my lash line. For the Botox and the fillers under my eyes I'm going to be very honest and say this is something I have been considering and had an interest in for years. Fillers more so that Botox as luckily I don't have a very 'expressive' forehead-but I had some distinctive vertical frown creases above my eyebrows-one was so bad that when I was with Mike he used to call it my Harry potter scar. But my under eyes are hollow on the outer sides and had gotten much worse over the past two years. I hated it. I had distinctive circles round my eyes and deep tear troughs. Make up cannot cover that up. I watched Ashleigh's snapchats when she had fillers under her eyes and she described the sort of person who benefited most from them and that summed my eyes up to a tee. 2016 was a pivotal year for me. I can see now that 2015 was a real struggle for me. I really was finding it difficult to come to terms with where having cancer had left me as a person and my future. I was very bitter about until about November 2015, when one day, after a conversation with my boss Raj it was like the fog finally cleared. He said something so simple to me but it was like a lightening bolt of realisation and from that day onwards, I started to change. I started to want to become a better person and a lot of that was centered around how I looked. Over the last 12 months I have lost 4 stone in weight and ended a 13 year relationship that was making me horrendously unhappy. I had to undergo a further major operation in May after another two tumors were discovered on my right ovary and menopause hit me like a ton of bricks in July. And I would be lying if I said that having cervical cancer hadn't somewhat damaged my self esteem as a woman. I've had major, extremely personal, invasive surgery. I can't offer any future partner a 'normal' marriage and kids package. Despite all that, I'd much rather be where I am today than where I was 12 months ago. I've actually loved being single and the freedom it brings. I've worked extremely hard both professionally and internally to become the stronger, happier and more positive person I am today. And that's the mindset to be in when considering any type of cosmetic aesthetics. I didn't want to change the way I looked, I just wanted to be the best version of me. The only way I would ever have had these treatments done was with someone who came really highly recommended and Dr Zamani ended up being recommended to me by two people. Her extremely discreet London base is Sloane Street, far from the Madding Crowd of Harley Street. The Monday I visited her she was fully booked and I was her last patient. I got there early and the patient before me who was sitting next to me was extremely nervous. The clinic picked up on this and one of the patient advisors, Lexi was brought down to talk to her. The comfort and care shown by Lexi made me feel at so at ease, even though I wasn't even the nervous one-I was just eagerly eavesdropping! Lexi obviously had a huge passion for understanding and negating clients concerns but was also so enthusiastic about how fantastic Dr Zamani was that I was really excited about my appointment. Dr Zamani has also received a huge amount of positive press and so I just didn't even really think of anything negative or scary about what I was having done. I was such a bad blogger here because I was so excited about the treatment and interested in everything Dr Zamani was saying that I didn't take any photos! Luckily Ashleigh was with me and recorded a lot of it which I uploaded it to my instastories and I have (very badly) managed to put what was recorded into one video which is on youtube. This is my first ever attempt at something like this so I apologise for the quality and the basicness of it-I just wanted this to be a very real and relatable account of what happened. The whole consultation and treatment took no longer than 45 minutes-for everything. I was wowed by that-that you could basically go in and walk out with confidence building changes in your lunch hour. Dr Zamani has an aura of calm and professionalism where you feel immediately that you trust this person and I was hanging off her every word because I found it so fascinating. We talked about what my concerns were and about my past medical history. 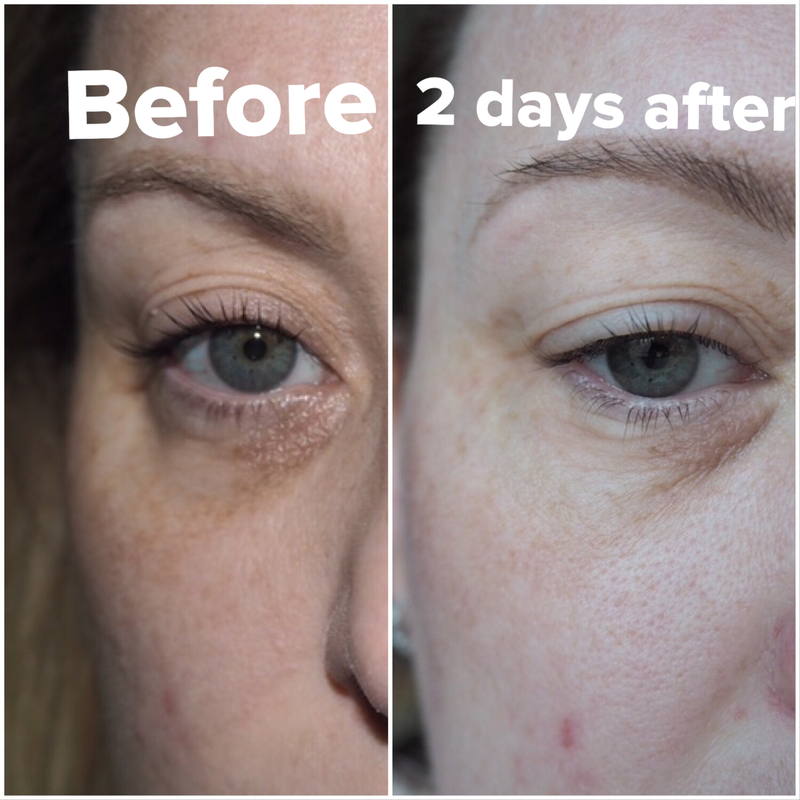 Dr Zamani told me that the hollowness around my eyes is due to loss of collagen-which could be caused by the severe hormonal changes my body has been though over the past two years. We started with numbing cream under my eyes to prepare for the filler injections. I have to admit, I am not the biggest fan of needles and having a blood test is one of my most feared procedures. The more numb the better so I was happy for the cream to be slathered on. We then started with the Botox-although I actually had Azzalure on Dr Zamani's recommendation. My only real issues are the creases between my eyebrows and Azzalure can specifically help moderate to severe glabellar lines (vertical lines between the eyebrows) and it doesn't have that 'frozen' look Botox can have sometimes. Dr Zamani has a featherlight touch. You can see if you watch the video, but if you don't (or can't because of the needles although you don't really see them I promise) my reaction following the three injections she placed between my brows was 'I didn't even feel it'. And I wasn't numbed there at all. I didn't see the needle, feel the needle, feel the sensation of anything entering my face, there was no blood and I would go as far as to say it was a pleasant experience. Dr Zamani told me that the full effect of the Azzalure would take 5-7 days to kick in but I saw an immediate reduction in the depth of my major 'Harry Potter' scar and the other two lines have plumped out and are smooth. My forehead doesn't feel frozen and I can very easily move my eyebrows up and down (watch any of my instastories or snapchat and you'll see as I natter away) but when I frown, between my eyes doesn't crease-which is awesome! This is definitely something I want to maintain going forward, Dr Zamani told me that Botox (or similar) lasts around 6 months on most people but can be more or less depending on the individual. I'm definitely open to having more further up my forehead too if Dr Zamani thinks I need it. We then moved on to the skin tag removal-I only wanted the ones on the lashline taking off but Dr Zamani told me she could easily remove the other two. One thing she did do, which wasn't caught on video and was probably the only (very slightly) uncomfortable part of the procedure was inject anaesthetic into my eyelid to slightly numb that area. She trimmed the one off my eyelid first and the one below my eye with fine surgical scissors and I felt her do them but there was no pain. But it did make me slightly worry the one on my lashline might be a bit more painful. You can see her removing it in the video and me chatting away to her-I couldn't even feel it when she took it off!! I genuinely thought it would bleed and scab and that I might even need a stitch. I was worried about not being able to wear make up the next day because of the removal and had told my friend Hannah that I was coming to our afternoon tea in big dark glasses! But it was as though she had just swept it away. I could have cried with happiness it was gone. I've got zero scars from this treatment, there was no bruising and I just wore make up as normal afterwards. Then it was onto to the fillers. I imagine this is what most people would be most daunted about having. My main concern was the hollowness around my eyes. You can see in these pictures that I emailed to Dr Zamani pre-treatment how bad it was. It was like my skin had just sunk back in on itself. Dr Zamani did say mine was quite an extreme case in someone as young as me (36) but that this hollowness was probably related to loss of collagen following the menopause. 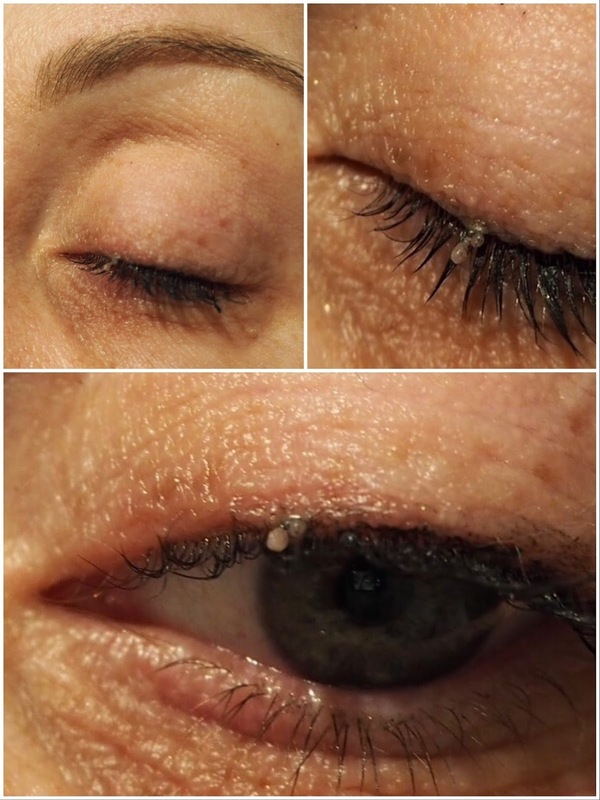 She needed to inject 1ml of filler into each side-so 2ml in total, whereas most people only need under 1ml for both eyes. And you pay by the ml you use for this treatment which is purchased in 1ml tubes. Any partial uses of the tube cannot be reused for health and safety reasons obviously and are disposed of following the treatment. As you can see from the video I have 5-6 injections each side and not one single one was even uncomfortable nevermind painful. It was strangely relaxing listening to Dr Zamani's voice talking me though the procedure and I got hundreds of messages on instastories saying 'you're not even flinching'! The filler Dr Zamani chose for me was Juviderm Volift with Lidocaine (lidocaine is an anaesthetic causing numbness which helps reduce any pain you may have further and it kicks in as soon as it's injected) because of the long lasting natural results she can achieve from it. My fillers should last anywhere between 1-2 years. Juviderm is a hyaluronic acid gel which is injected under the skin to plump, smooth, fill and add back lost volume. During the treatment my undereyes felt slightly tightened, as if I had a face mask on. One thing that also wowed me was that Dr Zamani did everything on me by eye-I was kind of expecting tape measures and I did asked her about this. She said she did occasionally use them but generally she worked by eye. I was lucky enough to watch her injecting fillers into another patients lips (with their consent of course) and was amazed at the way she worked around the mouth, visually identifying where to inject to get the most even, natural look. After my fillers were injected, Dr Zamani massaged the under eye area to ensure there was no lumps of filler or uneven areas. And that was it! I was done. You could see an immediate improvement on the lower, outer part of my eyes eyes and I have found that I look far less tired, better rested and less 'shadowy' in that area. My crows feet are also much reduced. An hour after the treatment as the anaesthetic started to wear off I felt a slight stinging but no pain. The next day I felt like one side of my right eye was slightly bruised but it didn't visually look bruised. I had no bruising, swelling or pain. I had some tiny red dots where the injections had been placed around my eyes and a small red mark where Dr Zamani removed the skin tag below my eye. All of them were undetectable once I had make up on. On day two I had a tiny bruise under my left eye and a patch of swelling that lasted about ten days. I was able to contact Dr Zamani even though it was Christmas time and I followed her massage instructions and took an antihistamine and now the filler has completely settled. I also bought a small jade roller from Cult Beauty and used that a little-but in all honesty I am lazy and forgot to use it more times than I remembered to! But my make up now goes on so much better! I feel fuller and smoother around the eyes. You can see on the photo below how the hollowness looks much less and the filler has plumped the area. Yet if I hadn't told you, would you know I had had it done? I think it looks so natural. A couple of unexpected other positive effects I have also had, and I don't know if this is from the Botox or the filler, is in evenness between my two eyes and the surrounding area. I have always had one eyelid that is more hooded than the other but they now seem to look relatively similar. Secondly, my eyebrows were also not quite even-one sat naturally higher than the other before these treatments but now is a lot more even. Dr Zamani constantly said through the treatment that she would rather under correct than over correct and then add more later if needed. Her aim is to achieve the most naturally enhanced 'best version' of an individual. She talked me through every step of every procedure which is something I personally really like when having any kind of treatment for the first time. I know some people may differ and be more 'just do it and don't tell me' and I am sure she would tailor her style as per the individuals preferences. Also, it's important to note that not all surgeons and practitioners are as excellent as Dr Zamani. I highly recommend doing significant research into any type of procedure like this that can make permanent changes to your appearance and to go with the best you can afford. What's also important to remember is that each person will have a very individual reaction to the treatments-whilst I experienced no down time whatsoever, some people may experience more bruising or swelling which is why Dr Zamani does not recommend having treatments like this immediately before big events. There is also some simple aftercare tips she will recommend to achieve the best results post treatment. I honestly left the clinic feeling like I was walking on air. It had been a truly confidence building, empowering and uplifting experience and I am thrilled with the results. I can see how these kind of treatments do become addictive to some because even I catch myself thinking 'oh what if I ask Dr Zamani about doing this or this' after my experience with her. Like anything though, it's very important to find a professional and to trust their judgement. Follow them on social media and look at their work. Find a surgeon who is not afraid to say 'no' to you-this is so important. They're the experts, not you. To remember that they are not a miracle worker and that you're not going to walk out looking like Giselle. I'd highly highly recommend Dr Zamani-she can be contacted at the Cadagon Clinic on 0044 207 901 8500. She's also on Instagram, Facebook and Twitter. I'd love to know your opinions on these kinds of treatments-is it something you have done, would do or wouldn't do?